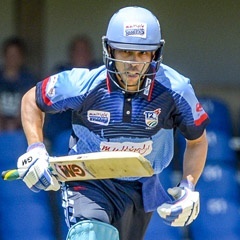 Cape Town - A battling, unbeaten Farhaan Behardien played a pivotal role as the Titans maintained their unbeaten run in the RAM SLAM T20 Challenge with a fighting five-wicket win over the Knights at St George's Park Cricket Ground in Port Elizabeth on Sunday. The defending champions looked all set for a first loss of the season after slipping to 54 for four after 11 overs in pursuit of a 134-victory target, but the ever-reliable Behardien struck 56 (39 balls, 3 fours, 4 sixes) to secure a sixth win out of eight – two of their games were washouts. It was another super victory for Mark Boucher’s side, whose Standard Bank Proteas-rich squad have looked invincible so far in 2017/18. Apart from Behardien, there were also some stellar performances with the ball from Dale Steyn and Tabraiz Shamsi after they claimed two for 20 and two for 21 respectively from their allotted overs. The Knights, one of several teams in a log-jam as the competition reaches the business end, had won the toss and batted first in the first game of a double-header in the Eastern Cape. But they struggled to get going and eventually had to settle for a modest 133 for seven thanks to David Miller’s 43 and 31 from Grant Mokoena. Bowlers Aubrey Swanepoel (2/20), Duanne Olivier (1/31) and Shadley van Schalkwyk (1/30) then looked to have given them a chance by blowing away the top order cheaply. Quinton de Kock (17), Henry Davids (7) and Aiden Markram (8) were the big wickets to go early. But Albie Morkel (27) added a vital 38 with Behardien, before Chris Morris smashed an unbeaten 17 off 10 to help the Pretoria-based side guarantee themselves a home semi-final with two games to spare.